White chocolate has got to be one of the most misunderstood ingredients, despite its potential. 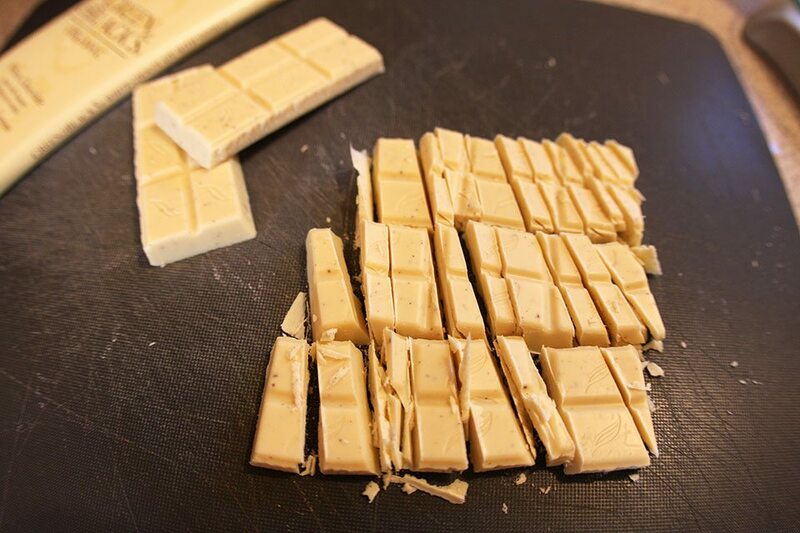 Many think they don’t like white chocolate. And why? Mostly because of misinformation. Let’s clear some things up. You won’t regret it. White chocolate isn’t actually chocolate at all. Gasp! It is made from the cocoa bean just like dark chocolates, but it is without the one key ingredient that makes the mix technically chocolate: cocoa liqueur. Cocoa liqueur is a bi-product of the cocoa bean and is what gives chocolate the brown color. 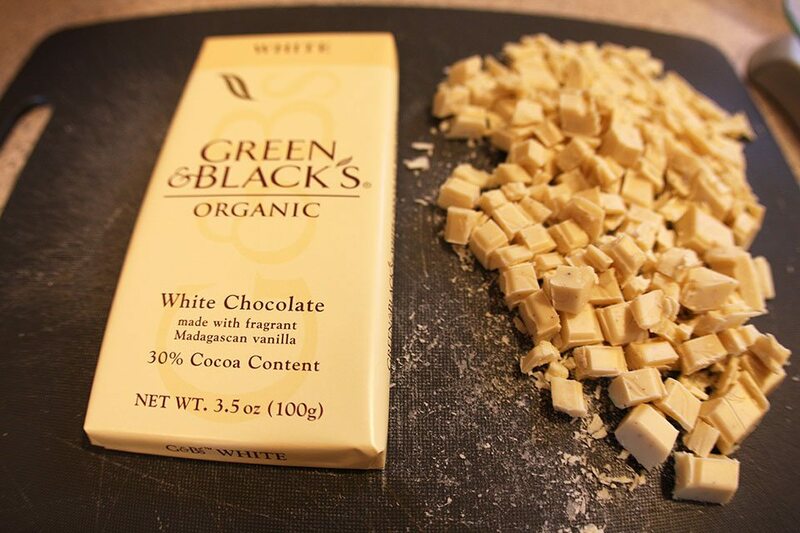 When white chocolate is made, the cocoa liqueur is extracted removing it’s right to be chocolate. So what is left if it isn’t chocolate? The most basic ingredients include cocoa butter, another product of cocoa bean processing, sugar, milk and vanilla. So what is the big problem? Most readily accessible white chocolate isn’t actually white chocolate at all. Double gasp!! If you have ever been turned off by white chocolate because it was too sweet, was waxy in texture or had a strange flavor, then you probably weren’t eating white chocolate. True “WC” is creamy, has a delicate yet rich and aromatic flavor with a hint of vanilla, and is definitely not a replacement for the dark stuff. It has what it takes to stand on its own. How can you tell the difference between “WC” and the faux stuff? 1. White chocolate isn’t actually white. It should be ivory in color from the cocoa butter. So those porcelain-white Nestle Premium Chips don’t pass the test. 2. Look at the ingredients. It should contain at least 20% cocoa butter. The fakes contain hydrogenated oils such as safflower or kern instead of cocoa butter. Valrhona – Made in France. This is my absolute favorite, white or otherwise, and one of the best chocolates in the world. It is hard to find without ordering online, but some high-end stores will sell it in bar form. Trader Joe’s of California sells bars, but only the milk and dark varieties from what I’ve seen. Ghirardelli – American-made based in San Francisco. Very common. From what I can see, their white chocolate bars are the real deal, but their classic white chips are not. Sorry. Some may be familiar with Scharffen Berger, also out of San Fran, and wonder why it is missing from this list. They specialize in artisanal dark chocolate; no whites to be found here. So in summation, drop the Nestle and run! Below is a simple recipe that shows off what delicious white chocolate is all about in an incredibly moist semolina and almond-based cake, no ‘icing’ needed. 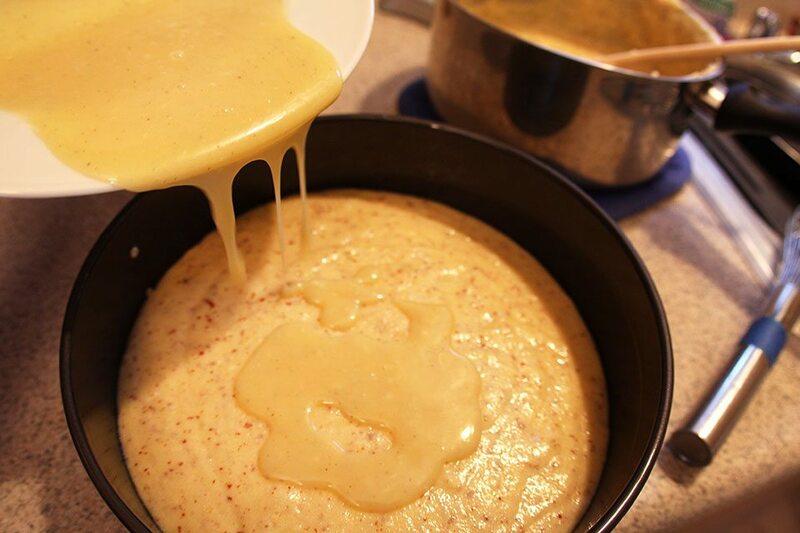 White chocolate ganache is added, which bubbles up through the batter during baking. Ohhhh! I promise it will make you fall in love (or reignite your flame) with white chocolate. Preheat oven to 350F (175C). Grease 9″ spring for pan with butter. Line bottom with parchment paper. Cook milk with salt and zest on medium heat until milk gently boils, stirring frequently to prevent pan scorching. Reduce heat to low. Very slowly add the semolina while whisking. Cook for 8m, whisking frequently. Mixture will get very thick and boil. 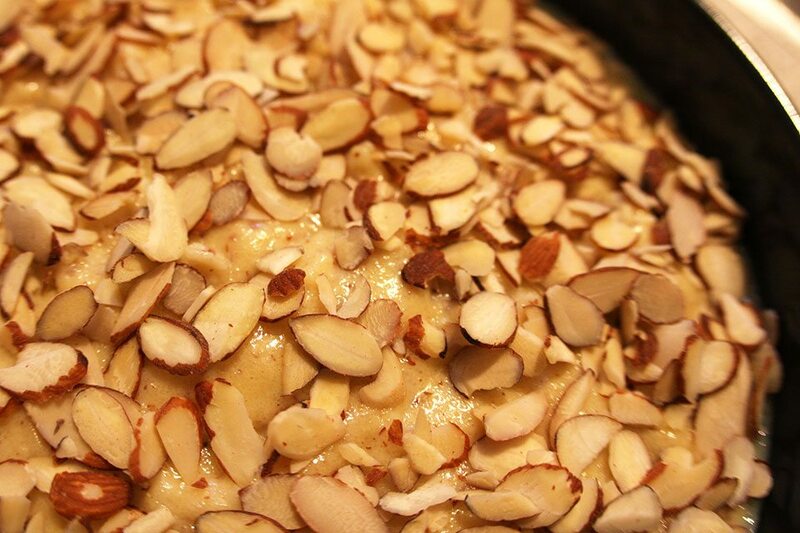 Add ground almond and sugar while whisking. Cook 1m. 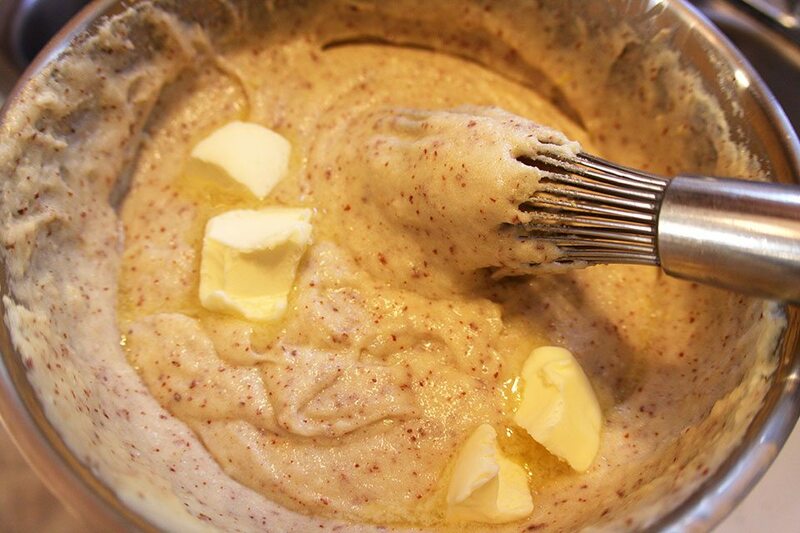 Remove from heat and whisk in butter. Let cool while preparing white chocolate ganache. Heat cream to just boiling. Pour over chopped chocolate. Let sit for 3m or so to let the chocolate melt. Then slowly whisk chocolate and cream together until smooth. This can also be done in the microwave. Microwave cream and chocolate in 45s increments until chocolate is melted then whisk together. 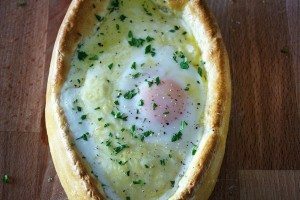 Once semolina mix is lukewarm, switch to a wooden spoon and add eggs slowly, approx one at a time until each is incorporated. Put half the batter in the spring form pan. Pour white chocolate ganache over the batter. Add rest of the batter and smooth out batter with spoon. 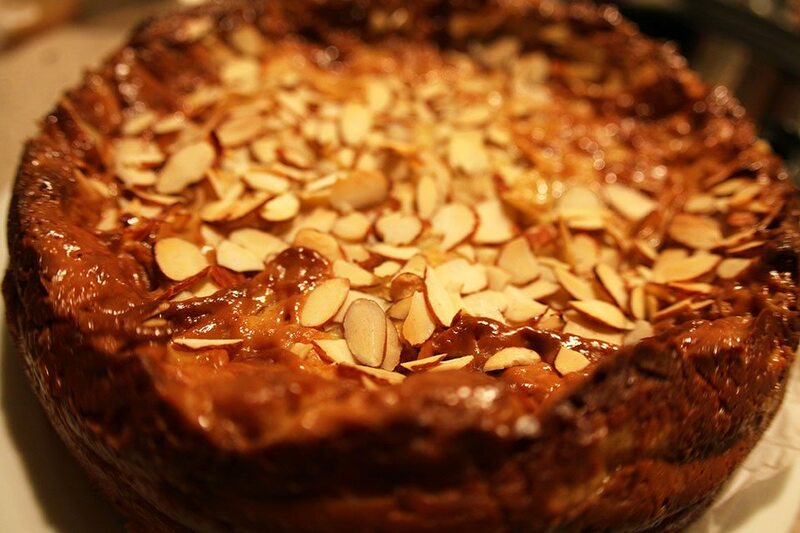 Top cake evenly with sliced almonds. Bake for 55-60m until edge springs back to touch and/or a toothpick comes out clean. Just so you know what to expect, the egg whites in the cake cause the cake to ‘souffle’ while baking. So the cake will sink about 1″ while it cools, creating a small ridge around the cake. 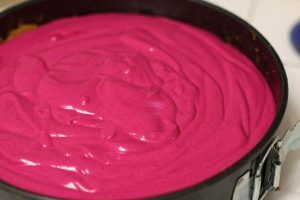 Allow the cake to cool in the pan and unmold. If grinding your own almonds, grind them in a food processor with the sugar. Then sift mixture to get out the larger pieces of almond that didn’t grind. This will keep the cake consistency smooth. Ted just sent me this link … OHMYGOD I love this cake!!! it is beyond amazing Sara! such a shock when it just melts in your mouth. I will be dreaming about this cake after I eat my last piece tonight.. thanks again for making it! Okay, I will try this! Def. agree with you on the White chocolate. G & B fan here. Have been using it with lime curd for a cake filling but like this idea of almonds too. Hey Pauline!Using it lime curd sounds DIVINE. I might have to take you up on that suggestion. 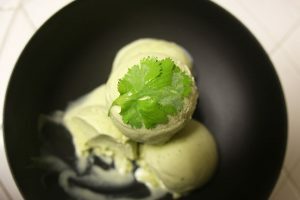 The richness of the white chocolate, and the tartness of the lime seems like a match made in heaven. Thanks!